Greetings once again from Tokyo. This blog post will include the last batch of weekend specials for November 2010. There a couple of exiting weekends lined up over the next two weekends including the Toyota Motorsport Festival this Sunday and the NISMO Festival next weekend at the world famous FUJI Speedway!! 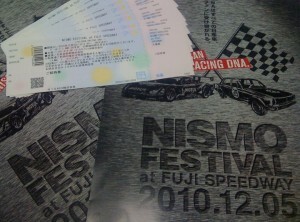 For those who are fortunate enough to make it to this year's Nismo Festival and still need to pick up their tickets please let us know and we will do our best to arrange delivery of tickets for you and your group. For this Weekends Specials, RHDJapan will extend an additional 6% discount off our regular sale price for the following 7 Brands!! ZELE InternationalExcellente fin de semaine à vous tous depuis Tokyo ! Voici les promotions du dernier weekend de Novembre. Deux importants évènements vont se tenir bientôt, le Toyota Motorsport Festival ce dimanche, ainsi que le Nismo Festival le weekend prochain, se déroulant au très célèbre FUJI Speedway! Pour tous ceux qui ont la chance de pouvoir participer cette année au Nismo Festival, et n’ont pas encore récupérer leur tickets, nous offrons notre aide afin de vous assurer la livraison de ces derniers pour vous et votre groupe. Place maintenant aux promotions du weekend ! RHDJapan offre 6% de remise additionnelle sur tous les prix de vente des 7 marques suivantes !! ZELE InternationalGreetings once again from Tokyo. This blog post will include the last batch of weekend specials for November 2010. Ralliart Discontinuation Sale 10% off all items » « FREE TRD 2011 Calender! !